Blog Conference Tips | A Savings WOW! Blog conference time is starting up again, with Blissdom and NAMS right around the corner. We remember when we attended our first big blogging conference, which was the 2010 Disney Social Media Moms Celebration. We didn’t know what to expect, but it was a good eye-opener for us on how to handle future blogging conferences. Since then, we’ve attended the 2011 Disney Social Media Moms Celebration and the 2011 Brands & Bloggers Summit. Maria has also attended the 2010 & 2011 BlogHer, Brandcation, 2010 & 2011 SaveUp, and 2010 Build-A-Bear “Connecting in the Cyber Century” conferences, to name a few. This year, we are scheduled to attend three blogging conferences (so far). – Select the blogging conferences that appeal to you and will help you reach your blogging goals. Check out the list of blogging conferences on Blog Conference Guide’s site. – Prepare a 30-second elevator speech, keep practicing it beforehand, use it whenever anyone asks you what you blog about – which you will be asked often. – Bring a sheet of labels with your contact information, especially for conferences like BlogHer, where you will be visiting lots of vendor/exhibit booths and may be asked to fill out forms for prize drawings. You will save a lot of time and keep your hand from aching by doing that. – Get something to hold the business cards you will receive from other bloggers, vendors, and sponsors. What works for us is a small accordion folder (like one for coupons) so we can separate it by category. – Make friends with fellow bloggers. The best experience has been getting to know other bloggers by rooming with them (it also helps to cut the costs for lodging). – Take lots of notes. Sometimes you may think you’ll remember what you want to put into action from a conference, and by the time you get back to your room or back home, you’ve already forgotten it. If you list 3-5 things you’d like to put into action to improve your blogging skills based on what you learned from the conference, you’re more likely to do it (and it won’t be as overwhelming as trying to remember everything you learned). Our most important tip is – bring A LOT of business cards! It’s okay to bring more than you need, but it is definitely a lot harder to write out your information when you’ve run out of your business cards (plus it looks less professional). Maria has had this happen to her and had to take scraps of paper from her purse to write out her information. It was a little akward when everyone else was exchanging business cards and she’s handing out scraps of paper. 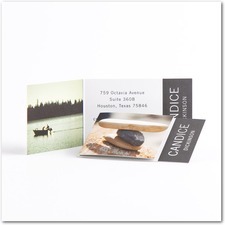 Tiny Prints has a line of business cards that can be customized. We especially like the design below because it is different than just your typical, traditional business card. It also can hold a lot of information that a typical business card can – don’t forget to include your social media information on it, since many companies are reaching out to bloggers that way. They have a wide-range of designs, so take a look at Tiny Prints’ business card selection to see which fits your style! One thing we have to remind you is to proofread, proofread, proofread your card! We’ve had it happen where we forgot to include our email address on the business card and didn’t even realize it until a vendor pointed it out to us because we had just gotten so used to the design that our eyes fooled us into thinking it was on there. Make sure to have at least 3 pairs of eyes look at the design before submitting your order. What is your favorite business card design? Check out Tiny Prints’ line of business cards! Great tips!! Will have to remember if I make it to any conferences this year. Thanks for posting!